It took three years to build. Now, finally, boys and girls from all over the East End and Essex are making their way to Bridgewood High. It’s a school for future stars: a place where dreams become reality. A place where the brightest talent is polished, and every skill is made to shine. As the glittering gates open, no-one can say exactly what the future holds for Bridgewood High and its new team. But trials and triumphs, alliances and rivalries, and heaps of dazzling football games are sure to lie ahead. First in a blockbusting new football series. 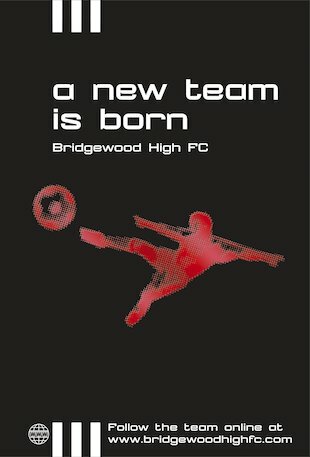 Follow all the action online at www.bridgewoodhighfc.com! It’s a nice book. A must read for football fans. I love football and thought this book was brilliant. My favourite bit in the book was the matches, they’re really exciting. The website about Bridgewood High is cool and has loads of stuff on it from blogs and match reports to designing a mascot and also voting for your favourite player. Would recommend it to all football fans who love the game as much as I do!